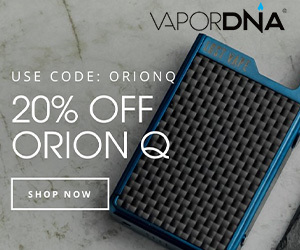 Like Aspire and Kanger and SMOK, Horizon is a pretty well known player in the vape space. It’s made some very decent tanks in the past; I even owned the Arctic Turbo’s predecessor, the Arctic. But now the company is back with something, well… a little special. It’s called the Arctic Turbo and, boy, is it a unique little setup. I cannot remember the last time I tried a tank out that was as interesting as this one. Not only does it feature one of the most unique coil systems on the market, but it also has plenty of other USPs besides that make for one hell of a vaping experience. As sub-ohm tanks go, you’re kind of spoiled for choice — there are literally thousands available. Few make it to the level of the UWELL Crown, achieving critical acclaim across the board, but I think Horizon’s new Arctic Turbo setup can do just that — it really is one of the most engaging tanks I’ve tested in quite some time. Read on to find out how this tank rocked my world. Wrapped up nicely in the acrylic style case is the Arctic Turbo in all its glory. The front is crystal clear which gives you the full display of what you get. On the reverse side you are presented with some information on the Arctic Turbo and what’s included. The design is close to what we have come to know and love about our Arctic tanks but with some minor changes. 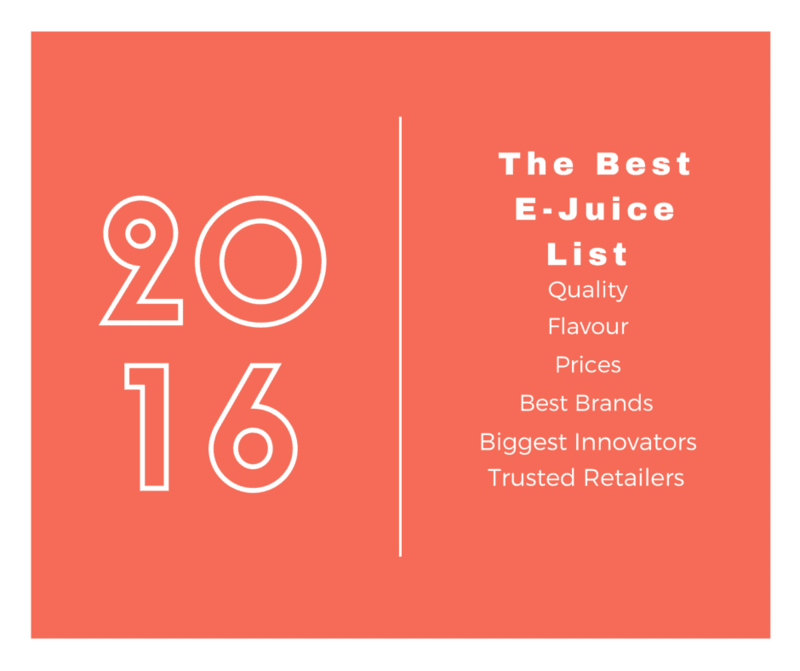 Some of those changes include the top fill design which is an industry standard at this point. Another change is the “Turbo” aspect. This is located at the top just under the 510 drip tip. It’s function is to cool down the vape and increase air-flow, hence the turbo-branding. 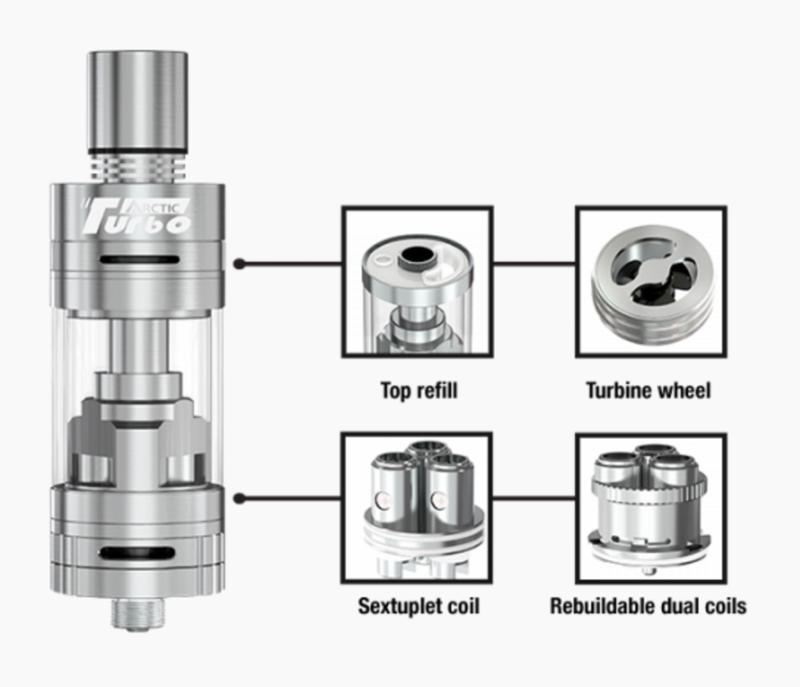 The coil system is amazing too as you can have one, two, or even three coils in at the same time. How this works in pretty ingenious. 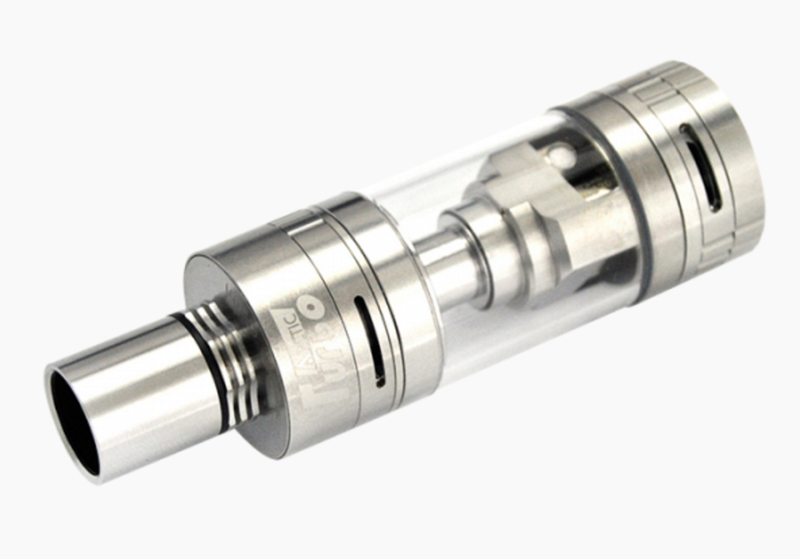 Inside the tank is socket in which you can plug one, two or even three coils which makes for a rather interesting vaping experience. The Arctic Turbo is also very easy to clean, as it comes apart with ease. Putting the tank back together is a breeze as everything is so well machined that it just slips back into place. 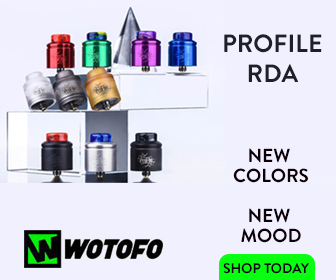 You will notice right under the drip tip you have heat fins; these help with the cooling process so you can vape comfortably at high wattages. All in all this is a very feature-packed device, even by today’s high standards. 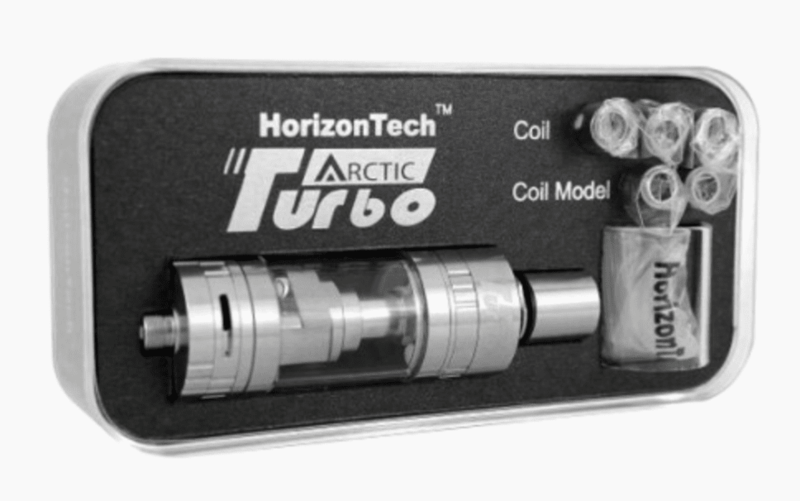 Arctic Turbo Review: Performance and Coil. How Are They? Unscrewing the top cap to fill the tank was perhaps the easiest top fill I have ever used. Once filled and after waiting a few minutes I decided to toss this great looking tank on my DNA200 device figuring I would need something with true power. I started off at 40W and barely got anything so I decided it was time to make some major adjustments to the way I vape a new coil as these required more power. I cranked the power up to 60W and bam! I got some decent flavour and clouds. Again, I turned it up to 70W and what I got was even more flavour and clouds. I went even higher this time and set my power to 100W. Amazing flavour and clouds is produced with this tank. I decided that since I was already at 100W that 20 more wouldn’t hurt; 120W vaped flawlessly. Perfection from Horizon with the Arctic Turbo in almost every regard. Using the .2ohm dual coils I felt the need for more power. I decided 150W would be even greater and it was. But I didn’t go any higher, though — it dry-hit on the third toke. After I demolished my .2ohm coils, which took awhile. I dropped in the .6ohm dual coils (all 3) and did a test with these. I maxed out at 125W before the dry-hits appeared. I didn’t notice a difference between the 2 coil ranges, though, so if you want those 10 extra draws then stick with the .6ohm dual coils. If you are a power user then the .2ohm dual coils are the ones you want to be using. The Turbo works great when doing those higher wattages. I usually can’t go any higher than 125W max but with the Arctic Turbo’s cooling fan I was able to go to 150W with no problem. There is a slight downside to the turbo fan though. After every other tank you need to run the turbo under water to clean it as ejuice vapor does collect on it. Not a problem with me as I like to maintain my gear anyhow. You can remove the turbo and still use the Arctic Turbo normally without issue. 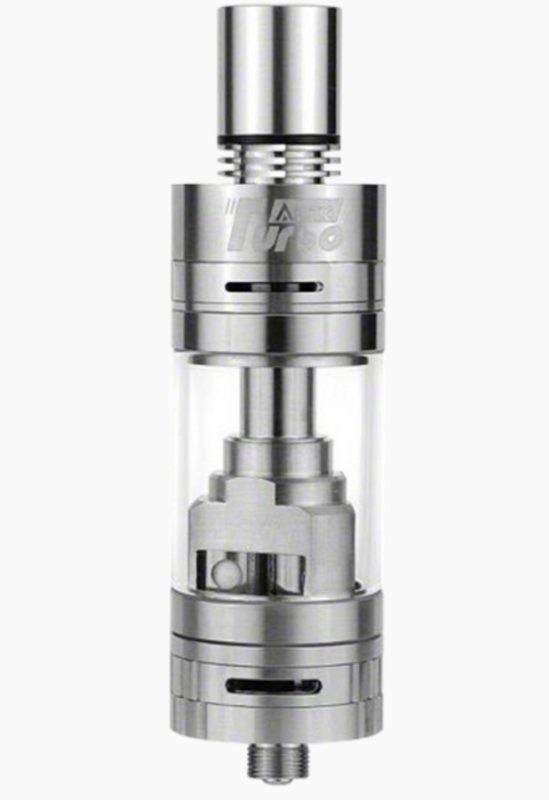 This tank does drink the ejuice at the higher wattage levels but that was expected. High wattage burns juice at a faster rate. A very nice sub-ohm tank all around. Everything this tank was designed for it does and it does it very well. This tank is hugely innovative and I believe the company are on to something here. How Horizon will top the Arctic Turbo remains unclear. But, what I know is this, the Arctic Turbo will be getting a hell of a lot of use as one of my daily tanks. I cannot recommend this setup enough. It’s been an absolute pleasure testing it.